Thin content is a major issue for every publisher. 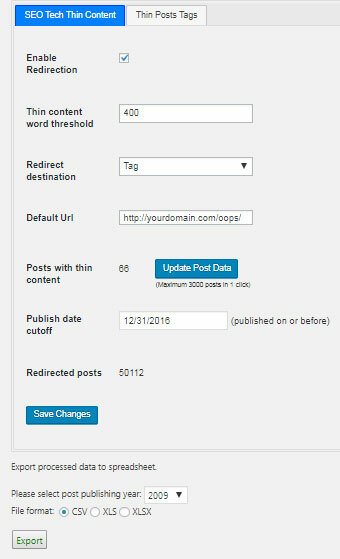 The SEO Tech WordPress Plugin will identify the content and quickly resolve the issue by using permanent (301) redirects. You enter a word count and publish date threshold that quickly analyzes the number of affected posts. So any posts published before the data cutoff and having a word count less than the threshold will be redirected. You can adjust both control until you are comfortable with the number and then enable the redirection. You can change the thresholds at any time or disable the redirection. You can also export the post data and examine it in a spreadsheet that includes the post title, hyperlink, hyperlink for editing, publish date, tags, categories, and the word count. You can control where the posts are redirected. You can redirect to one of the post tags (recommended), post category, the home page, or some custom URL. If you choose to use the tags or the categories and a post has no tag or category, it will be redirected to a default URL that you provide. You can also exclude any post from the rediection rules by editing a setting in the SEO Tech GA Fetch meta box. You can also force any post that is outside the threshold to be redirected by editing that same setting. Since the plugin focuses on older thin content is has the effect of removing that low quality content from the Google index while preserving the authority of the site by redirecting any inbound links. It is the most effective way to reconcentrate your domain authority across a much smaller number of fresher, higher quality posts. The plugin is compliant with most XML sitemap plugins. For the most consistent results we recommend the BWP Sitemap plugin. Any posts that are redirected will be excluded from the sitemap as per Google’s guidelines. Every publisher should be doing periodic clean and consolidation of tags. There should also be a set of tag guidelines for the authors, contributors, and editors. If you want to learn more about the causes and implications of thin content, you can learn all about it here. This is NOT a free plugin. It is specifically designed for publishers with years of content and thousands of posts. It should only be used under the supervision of an SEO content specialist. Our partners offer FREE no-obligation consulting on the implications of the plugin and whether it is best for you. Please click here to contact us and we will put you in touch with the appropriate consultant immediaitely. Nearly all consultants respond in less than an hour. The plugin subscription can only be purchased through one of our partners and costs $600 per year for the primary domain, and $150 per year for each additional domain.